This jewellery box was made for my mothers 60th Birthday. It is made from Jatoba with a burr Walnut top and a tulipwood banding. The trays are made from Birds eye maple. The splines and the handle are also Walnut. The hinges are SmartBox Hinge. This was my first box made with mitred corners and splines. I made it where i work and unfortunately some of the tools weren’t fantastic so i do need to invest in a few machines of my own to try to ensure the accuracy when cutting the mitres for example, but i am fairly pleased for my first attempt. I’ve managed to get hold of some reclaimed Burmese Teak which i think i will use to make the next one, now i have had a bit of practice i hope i have less issues with the next one. Beautifully done, and yep you proved boxes can be art! Very nice, great color combos. Nice work. It looks like you have all the basics down for boxes: Corner miters, splines, inset tops and bottoms, banding, lining, dividing the insides, finish, and design. Nice hardware and lift used here. You have made some beautiful wood choices. They work well together. I don’t know that they will help, or if you are interested, but here is a list of tutorials and jigs listed by topics that may make your box making easier. You might especially look at the tutorials on 45ing the corners and the band clamps blog. Keep boxing and keep posting. Tutorials: For methods used to make a box like that pictured above just click on the blue links below. They are arranged by topic. and thank you Boxguy i will definitely take a look at the tutorials, one thing im discovering is you can never stop learning and improving in woodwork. 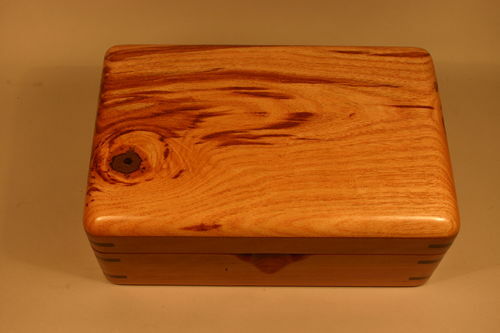 What a beautiful box, nice choice of woods and very well made….thanks for sharing.